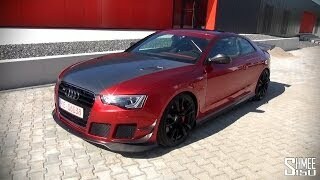 Audi RS5 rolled in the automotive market in the year 2014, coming directly from the house of Audi. The already fantastic convertible gets some new upgrades by the leading tuner which took its top speed up a notch. Apart from this the major change which came in the upgraded model is its aggressive and throatier sound which will undoubtedly leave an impeccable effect on the on-goers. 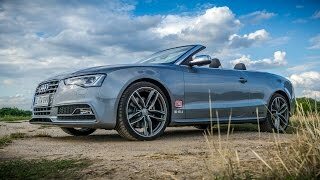 Let us have a look at the review of ABT Sportsline Audi RS5 Convertible 2014 to know how it makes the distinct identity. For ABT Sportsline Audi RS5 Convertible 2014, tuner concentrated much upon the visible changes that could enhance the performance simultaneously. In context to same, the first in our list is a new suspension kit that allows you lower down the riding height upto 1.6 inches and thus compliment the new set of 20-inch alloy wheels as wheel as wheel spacers, by adding bit of aggression and maintaining the control. Great new here is, that with ABT Sportsline Audi RS5 Convertible 2014 customers have the entire range of rollers from the house of tuner to choose from, each one featuring cast and forged designs. ABT has also worked upon the base model’s droptop appearance and enhanced it through newly inculcated fender vents. The major glory-adder here in this package is the exhaust system, which hooks directly to the catalytic convertors and with use of a pair of pipes and mufflers it creates rumbling sound that impeccably marks your presence on streets. Moving inside the ABT Sportsline Audi RS5 Convertible 2014 the first thing you’ll notice will be the ABT lighted entry, which though comes as an option but we believe it’s an option you won’t opt to leave. In the list of options buyers also get ABT floor mat kit and speed limiter override taking you a lap ahead. However there isn’t any change in the output figures. Beneath the hood of ABT Sportsline Audi RS5 Convertible 2014 still resides the same 4.2 liter V8 generating total output of 450 hp and peak torque of 430 nm. 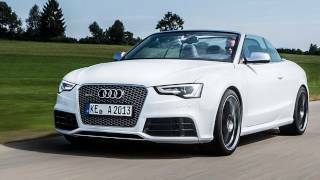 We personally believe it is already sufficient for a convertible; still the change here comes with the top speed of ABT Sportsline Audi RS5 Convertible 2014, which now touches mark of 180 mph.